The following is a presentation of the postal districts of Mexico 1856-1861. The links will take you to a page describing each individual district, with one or more examples of the stamps issued, and detailed information on the consignments according to Samuel Chapman. This is a work in progress, so please check back often. New pages will be added as time permits. During a short period in late 1858, Aguascalientes was the principal post-office in the district of Zacatecas. If you'd like to see a more complete display of district name overprints on the 1856 issue, you should visit Classic District Name Overprints. You can even pay a visit to the 1856 Collection pages for more nice stamps. The Hermosillo district is particularly well represented here. According to postal regulations, stamps were supposed to be overprinted with a district name. However, it is not unusual to find stamps missing the overprint. The reason for this could be a misunderstanding of the rules, laziness or oversight. 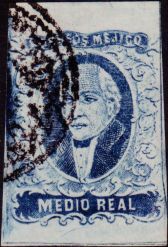 Sometimes pairs are found with only one of the stamps overprinted. Stamps without overprint can of course only be identified by the cancel. However, it is worth remembering that stamps sometimes were cancelled upon arrival, as opposed to being cancelled at the originating postoffice. In other words, a cancel is no guarantee that the stamp was from one of the consignments to the district where it was cancelled. Apam, plate I, pos. 19. Sz #35 from Otumba. Apam, plate I, pos. 60. 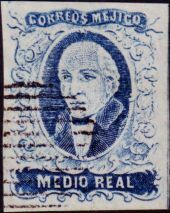 Stamps without overprint are often found with cancels from Apam. Many of these are remainders. Perote, Polotitlan, San Felipe del Obraje, Villa del Valle and Zitacuaro were not independent districts, but received Direct Emergency Shipments. Comments, corrections and ideas are always welcome. Please e-mail the webmaster.